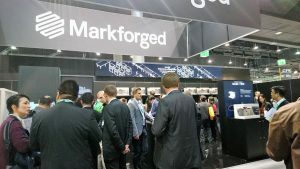 The Markforged booth at formnext was arguably one of the trade fair’s busiest this year. Over the course of four days, visitors, curious about the company’s latest technologies, gathered in droves to see Markforged’s latest Metal X 3D printer and its industrial printer series. And after featuring the company’s 3D technology as one of our top technologies to see at formnext this year, we were naturally pleased to have the chance to speak with Ibraheem Khadar, Project Manager at Markforged, at the event. Ibraheem: Formnext has been really beneficial for our business, as everyone who’s anyone is here. It seems that it’s on an even bigger scale this year – and keeps getting bigger. It really is the perfect place to meet all the right people, and our own presence has increased exponentially – we’ve had up to 40, 50, 60 people at our booth at a time! AMFG: What is Markforged’s vision going forward? Ibraheem: We definitely plan on having an even bigger presence at formnext in the future – we want our booth to be the focal point of the event. AMFG: How do you see AM technology evolving in the next five years? Ibraheem: I see additive manufacturing playing an even bigger role in engineering, manufacturing and design. And at Markforged, we plan to lead the charge by continuing to develop innovative solutions for 3D printing composites, plastics, and metals. Markforged has one key objective: to make 3D printing more accessible and affordable for consumers. Founded in 2013, the company made waves when it released the world’s first 3D printer for carbon fibre in 2014. Since then, Markforged has gone on to develop both desktop and industrial printing systems that can support a range of materials, from Onyx to kevlar and stainless steel. The company has also expanded its industrial series to include the X3 and X5 printers, in addition to its flagship X7 printing system. Both the X3 and X5, Ibraheem explained, can support Onyx, which is a strong and heat-resistant carbon fibre-filled nylon. With the X5 machine, users are able to reinforce the Onyx material with fibreglass, while the X7 enables Continuous Carbon Fibre reinforcement. And Markforged has also made its mark in the realm of metal 3D printing. In January of 2018, the company will be releasing its first desktop metal printer – Metal X. The machine uses the company’s Atomic Diffusion Additive Manufacturing (ADAM) technology, whereby metal powder, encased in a plastic binder, is printed layer by layer before being sintered and fused into a solid metal part. 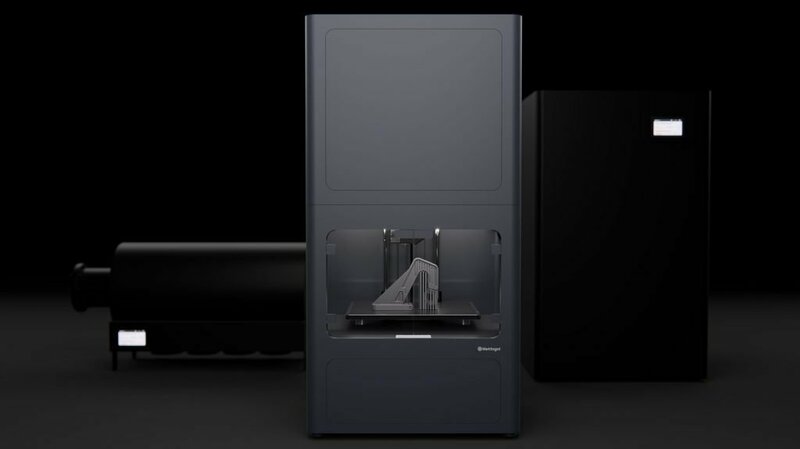 Markforged certainly seems set to achieve even bigger things, having recently received $30 million in a funding round from investors such as Microsoft Ventures and Porsche. With the buzz around this startup unlikely to dissipate anytime soon, we’re eager to see what new technologies it will come up with next. You can find out more about Markforged here. This article is part of our formnext spotlight series, featuring some of the companies that showcased at formnext this year. You can read our previous feature on Additive Manufacturing Technologies here.